Advocacy for religious freedom has become a global project while religion, and the management of religion, has become of increasing interest to scholars across a wider range of disciplines. Rather than adopting the common assumption that religious freedom is simply incompletely realized, the authors in this book suggest that the starting point for understanding religion in public life today should be religious establishment. 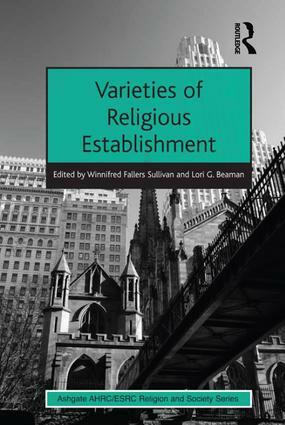 In the hyper-globalized world of the politics of religious freedom today, a focus on establishments brings into view the cultural assumptions, cosmologies, anthropologies, and institutions which structure religion and religious diversity. Leading international scholars from a diverse range of disciplines explore how countries today live with religious difference and consider how considering establishments reveals the limitations of universal, multicultural, and interfaith models of religious freedom. Examining the various forms religion takes in Tunisia, Canada, Taiwan, South Africa, and the USA, amongst others, this book argues that legal protections for religious freedom can only be understood in a context of socially and culturally specific constraints. To read more about the book, please click here. Read a preview here.